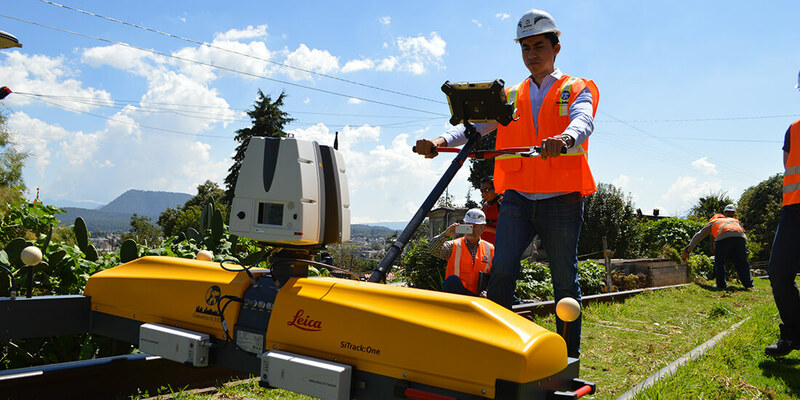 The Consorcio IUYET team used a Leica SiTrack reality capture system to obtain point clouds of the surroundings and sub-millimetric railhead measurements. Courtesy Consorcio IUYET. Like most major cities, Mexico City has a traffic problem. But the logjams that cause headaches in other metro areas cause blitzing migraines in Mexico’s capital, where the traffic crisis ranks as the world’s worst. Commutes in Mexico City take an average of 66 percent longer because of congestion. During rush hours, that figure rises to 96–101 percent. For drivers, that means 59 extra minutes in traffic every day, or 227 hours each year. By comparison, commuters in Los Angeles—the most congested US city—spend 44 extra minutes in traffic daily, or 170 hours every year. Because of its perpetual gridlock, Mexico City suffers from bad pollution, high traffic-related fatalities, and low worker productivity. Fortunately, help is on the way through new infrastructure initiatives, the largest of which is the Mexico City–Toluca Interurban Train Project, on target for completion by mid-2019. 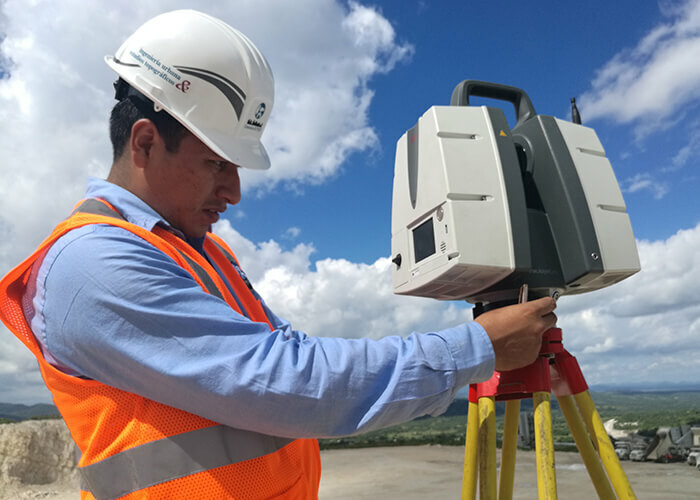 Using geoinformatics—a scientific discipline that surveys and interprets geodata to understand the earth’s surface—and costing $2.5 billion, Mexico City’s first-ever high-speed train will connect Mexico City with Toluca de Lerdo, the capital of the state of Mexico. The 36-mile electrified elevated railway will host trains traveling up to 99 miles per hour and transport 230,000 daily passengers, whose average commute time will drop from two hours to just 39 minutes. Mexico City has attempted big transportation projects before. In 2012, it opened a new line on its subway system: Known as the “Golden Line,” Line 12 of the Metro was forced to temporarily close 11 of its 20 stations just 17 months after opening them due to fears of derailment, the cause of which was not only poor construction but also poor technology. A rendering of the new high-speed rail. Courtesy Consorcio IUYET. Through the work of Consorcio IUYET—a Mexican civil-engineering-services company supervising its vertical construction—the Mexico City–Toluca Interurban Train Project seems destined to succeed where the Golden Line failed. The firm is using reality capture and Building Information Modeling (BIM) to gather geospatial intelligence, yielding submillimetric precision in its construction. 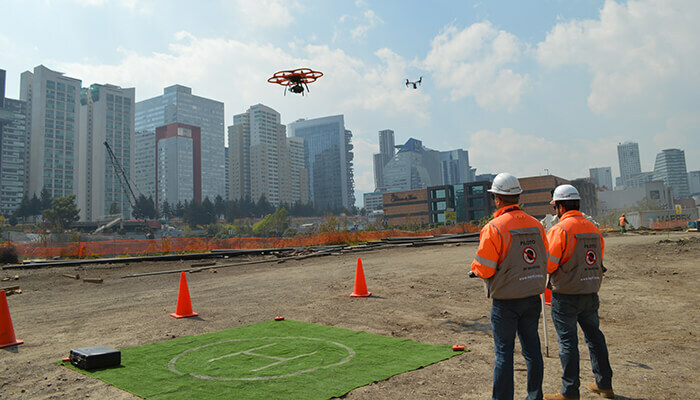 Consorcio IUYET drones captured images to geolocate trees and other obstacles on site. Courtesy Consorcio IUYET. Consorcio IUYET visited the site and created a reference network of GPS coordinates to align scans. For the actual scanning, photogrammetry using drones produced aerial images to geolocate obstacles such as trees, utilities, and bridges. To map terrain, the company used light detecting and ranging (LIDAR) and high-definition surveying (HDS) to capture geographical data. Finally, ground penetration radar (GPR) helped the project team see underground and bathymetric drones carrying sonar helped them see underwater. A Leica P40 ScanStation laser scanner captured 1,000,000 points per second with a density of 2 millimeters by 2 millimeters. Courtesy Consorcio IUYET. The finished 3D model has saved the day more than once. The construction team was worried about interference with Mexico City’s water system: Local government insisted the system was located outside the railway’s path, but scans showed otherwise. Without BIM, crews would have punctured the principal water main. Government stakeholders also benefited. At one point along the railway, elevated tracks cross over a mountainside where a forest had to be razed to make room for supporting columns. In response to environmentalists’ concerns, the government used Consorcio IUYET’s model to forecast various construction scenarios and choose the one with the fewest environmental consequences. “You can have a better solution because you have a better quality of information and a better quantity of information,” Ortiz says. 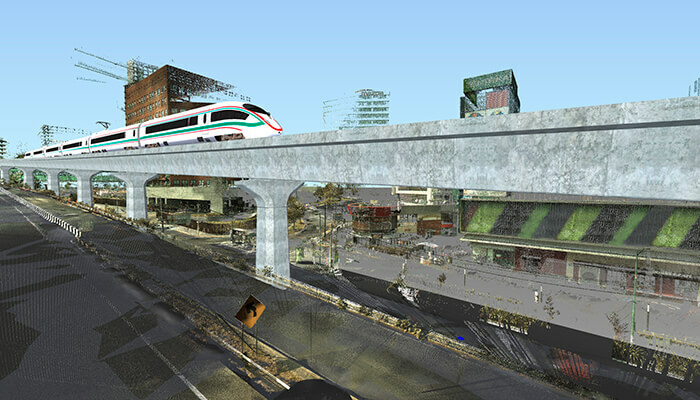 Get the toolkit driving Mexico City’s high-speed rail project. Building a safe train on such diverse and difficult terrain is hard to convey to laypeople, but that doesn’t bother Ortiz. What matters most to her is that commuters will soon get to spend an extra hour sleeping in or make it home in time for a family dinner.